Loch Ard Sailing Club (LASC) is in central Scotland, located eight kilometres to the West of Aberfoyle and nestling in the heart of the beautiful Loch Lomond and Trossachs National Park. The loch is fresh water and is the source of the River Forth. Loch Ard is approximately four kilometres long by two kilometres wide, and provides excellent sheltered sailing water. Travel is convenient from a large part of central Scotland. Club membership spans an arc from Glasgow to Stirling, Falkirk, Dollar and Edinburgh. Being an inland loch, there are no issues with tides, currents or salt water. The winds are generally moderate (though unpredictable! ), typically in the range force 1 to 4. The Loch lies in the protection of a valley running roughly East-West. The views around the Loch are magnificent, with Ben Lomond dominating the horizon to the West. See the tourist information on the Queen Elizabeth Forest Park, and photograph collections that include Loch Ard. You may wish to consult the local map of the Loch. Look at the general pictures and dinghy class pictures for an idea of the club and what happens there. 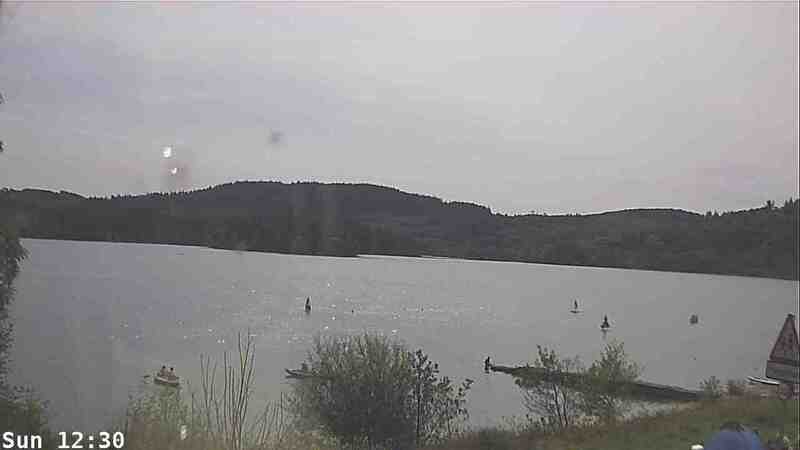 The latest web camera image of the loch is below; click it to see a bigger version. The short video shows the loch conditions at 14:45 yesterday; click this to play it (full screen if you wish). See also the earlier webcam images. Sorry - your browser does not support video links. A weather forecast for the Kinlochard area can be obtained from, say, the BBC, the Met Office or XCWeather. The club will be reopening on 21st April. See the Recent News page for more details. The Spring 2019 newsletter is now available. Members should have received this directly, but can also log into view this. The 2019 sailing programme has been released. See the Recent News page for more details. Click the controls at the left to go forward/back, or to play/pause all slides. Loch Ard Sailing Club is a dinghy sailing club affiliated to the RYA (Royal Yachting Association) - the governing body for sailing in the UK. At a local level the club works with RYA Scotland and with the area coach. The club is run by an elected Commodore and a committee of around a dozen members. The club-house contains separate changing rooms and toilets for men and women. The large common room includes a coffee bar where members may purchase snacks and non-alcoholic beverages on racing days. Members have the use of the club-house at all times, though safety cover is available only during formal races. The club site offers ample parking for cars, and for dinghies and keelboats. A limited number of moorings are available in the bay for keelboats (but not cabin cruisers). The club has its own powered boats for race management and safety. The club also owns a Wayfarer, a Laser, a Laser Stratos, two Toppers, two Optimists, and several canoes for members to use. The club organises a number of social events during the year. These include a friends and family day, barbecues, formal and informal dinners. The club particularly welcomes children and non-sailing partners of sailors. Although the club is primarily for members only, visitors may use the club facilities and launch their own boats on application to the club-house and payment of a standard fee. Note that multi-hulls, jet-skis and power boats are prohibited on Loch Ard.